Market Research is a systematic, objective collection and analysis of data about a particular target market, competition, and/or environment. It always incorporates some form of data collection whether it be secondary research (often referred to as desk research) or primary market research which is collected direct from a respondent. Perhaps the most common quantitative technique is the 'market research survey'. These are basically projects that involve the collection of data from multiple cases - such as consumers or a set of products. Quantitative market research surveys can be conducted by using post (self-completion), face-to-face (in-street or in-home), telephone, email or web techniques. The questionnaire is one of the more common tools for collecting data from a survey, but it is only one of a wide ranging set of data collection aids. either in the street or, for more complex projects, in people's homes. 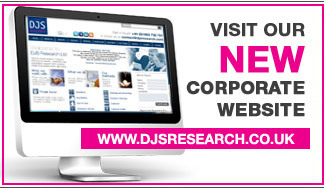 If you would like further information about any of the above market research methods please get in touch with DJS Research by filling out our on-line web form - click here or phone us on +44 (0)1663-732721 We look forward to hearing about your market research questions. If you would like to print out a copy of this document, please click on the Word symbol to view the document in Microsoft Word.